Critical component of windmill generator of gearless type of 800KW capacity impregnated with copper coils for producing elecricity. A stator winding is simply the stationary winding in an electric motor, either for rotary or linear. The stator in an AC motor is a wire coil, called a stator winding, which is built into the motor. When this coil is energized by AC power, a rotating magnetic field is produced. 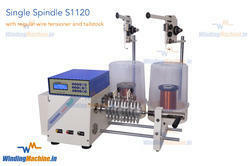 - This semi-automatic machine is designed for winding 2 poles at a time. 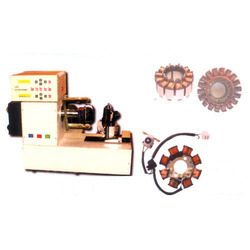 - Reciprocating & Oscillating shuttle head with polished carbide nozzles for winding operation. - Adjustable stroke for different yoke sizes. - Spring Tensioner for winding tension control of different yokes and pole sizes. - PLC and HMI Controlloed operation.